Mamnoon Hussain (Urdu: ممنون حسین‎‎ ; born 23 December 1940) is a Pakistani businessman, nationalist conservative, and politician. He served as the President of Pakistan from 9 September 2013 to 9 September 2018. Hussain briefly served as Governor of Sindh in 1999. His term as governor was cut short by the military coup d'état staged in 1999. After the PML(N) secured majority in general elections held in 2013, Hussain was nominated and elected as President of Pakistan on 30 July 2013. He won the election in a landslide victory winning 432 votes to his rival Wajihuddin Ahmed's 77 votes. ↑ Toor, Liaquat (9 December 2013). "Nation united against vices". Special report by Liaquat Toor. Pakistan Observer, 2013. Pakistan Observer. Retrieved 19 January 2015. ↑ "Dunya News: Pakistan:-Profile of presidential candidate Mamnoon Hussain..."
↑ Rashid, Haroon (2 March 2014). "Pakistan's invisible president: Mamnoon Hyssain". Special editorial report by Harood Rashid, the BBC Urdu correspondent. Islamabad: BBC Pakistan Bureau, 2013. BBC Pakistan Bureau. Archived from the original on 2 March 2014. Retrieved 19 January 2015. ↑ Staff report (9 September 2013). 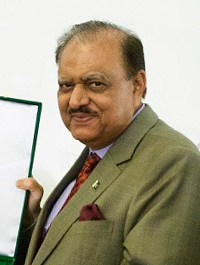 "Profile:Pakistani President Mamnoon Hussain". BBC Pakistan Bureau, 2013. BBC Pakistan Bureau. Retrieved 19 January 2015. This page was last changed on 22 April 2019, at 17:09.